Yup Joviers that's right... Grab your PC microphone, record your wishes for Christmas and New Year, send them to us and we will be broadcasting them during the holidays. So simple... Say your name (if you want), your country (and city if you like) and your wishes. 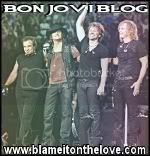 Upload them somewhere like https://soundcloud.com or http://depositfiles.org and give us a link that we can download them or send them to us via email on bonjoviwebradio[at]gmail.com. Where is [at] put @. We will be broadcasting them for sure and the whole planet will be able to hear you via internet and through B.J.W.R.